ROCKVILLE, Md., Aug. 9, 2018 /PRNewswire/ -- Choice Hotels International, Inc. (NYSE: CHH) is dedicated to exceeding the expectations of today's business travelers and making travel managers' jobs easier through substantial brand investments – all of which will be on display at the 2018 Global Business Traveler Association (GBTA) Convention. Choice will showcase the enhancements it has made to its brands that cater to business travelers, including the Cambria Hotels, Comfort, Sleep Inn, and WoodSpring Suites brands. GBTA attendees will have the opportunity to experience their brands firsthand through virtual reality tours at the Choice Hotels booth. 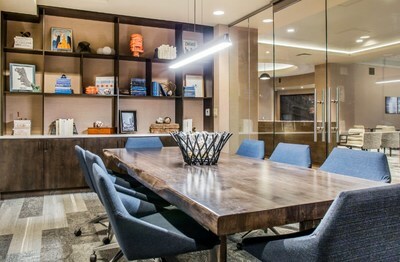 "Choice Hotels' dedication to delivering product experiences that travel managers can feel confident recommending, backed by devoted support and a seamless RFP process, underpins everything the company does across its brand portfolio," said Chad Fletcher, vice president of global sales, Choice Hotels. "Choice's high satisfaction rating among corporate travelers is a testament to the investment we have made not only to bolstering our brands, but also to ensuring a smooth process for travel managers." Cambria Hotels: $475 million corporate capital to expand in major business hubs, including Philadelphia, New Orleans, Phoenix, and Nashville, Tenn. Centrally located, Cambria Hotels allow guests to maximize their business trip and "Travel Like A Boss" while helping corporate clients deliver a hotel program that appeals to a broad range of travelers. Comfort: $2.5 billion brand transformation in collaboration with owners, including updated common spaces, renovated guest rooms, and a new logo complete with signage to signify the changes. As a result, the brand is experiencing consistently high guest satisfaction. WoodSpring Suites: Recently acquired extended-stay brand that is expected to grow to more than 250 U.S. properties this year, with a pipeline that includes Los Angeles, Washington, D.C., Portland, and San Francisco. Sleep Inn: A proven midscale brand that allows travel managers to balance a reliable property experience with effectively managing travel costs. With a simply stylish, nature-inspired design, the brand allows guests to Dream Better Here®. Virtual Pay: Improving the booking process for all Choice Hotels brands by enabling virtual pay functionality on ChoiceHotels.com. Travel Managers can use the Choice automated virtual pay solution for fast, seamless check-in for their travelers. "Choice Hotels offers a diverse selection of modern hotels and amenities that appeal to our travelers across the country. The commitment the company has made to its brands and loyalty program, coupled with the relationship I have with an account manager that understands my company's program goals, make working with them an easy 'choice,'" said Pia Williams, general manager, corporate travel & events, Dish Network. Choice continues to build upon its 37 million-member Choice Privileges program, which has been rated as best in class for two consecutive years in USA Today's 10Best Readers' Choice Award list, in addition to being named one of the 2018-19 Best Travel Rewards Programs by U.S. News & World Report. The Choice Privileges program provides exclusive member pricing, fast perks, and free stays through a point-based reward system for guests. If you are a corporate travel manager attending the 2018 GBTA Convention and would like to learn more, visit the Choice Hotels Booth #3521. Choice Hotels International, Inc. (NYSE: CHH) is one of the largest and most successful lodging franchisors in the world. With more than 6,800 hotels, representing more than 550,000 rooms, in over 40 countries and territories as of June 30, 2018, the Choice family of hotel brands provide business and leisure travelers with a range of high-quality lodging options from limited service to full-service hotels in the upscale, midscale, extended-stay and economy segments. Choice Privileges®, an award-winning loyalty program, offers members benefits ranging from everyday rewards to exceptional experiences. For more information, visit www.choicehotels.com.